Google has now announced the preview of newest version of Android at Google I/O 2015 in San Francisco. The New Android M will be later out in this year. As the preview started with some Nexus devices. This all New Android M will launch in Q3, 2015. Now the preview is available for Nexus 5, Nexus 6, Nexus 9 and Nexus Player. Web Experience- Chrome Custom Tabs is a new feature that gives developers a way to harness all of Chrome’s capabilities, while still keeping control of the look and feel of the experience. This will provide a faster and more intuitive user-experience when navigating between apps and the web. Google has been exploring trends in the way web content is consumed to provide a better user-experience when interacting with websites and apps. 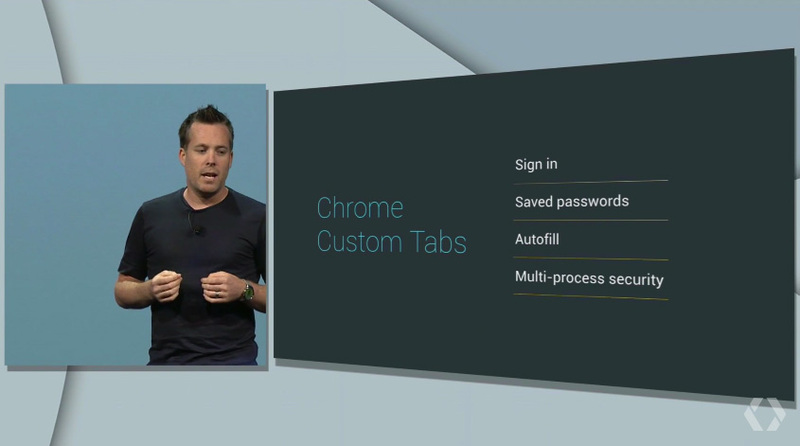 Chrome Custom Tabs supports automatic sign-in, saved passwords, auto-fill, and multi-process security to assist the integration of the app and web experience This Chrome tabs allow apps to open a customized Chrome window on top of the active app, instead of launching the Chrome app separately. App Permissions- App permissions got simplified and overhauled. Now the user able to choose to accept or deny individual permissions as they see fit. Permissions will now be requested the first time you try to use a feature, not at the point of installation. You can view permissions by type and see which apps have that permission granted. You can modify the permissions granted to apps at a later date in your Settings. All about giving the user complete control over their Android. Mobile Payments- Android Pay is another feature that makes the Google’s new mobile payment process for making payments easier and faster. No one has yet caught on this system of payment fields. It is being supported by American Express, Visa, Mastercard, and Discovery. AT&T, Verizon and T-Mobile are also on board for the new system. Any Android phone with NFC can make use of Android Pay. Android Pay will work with Android devices running Android 4.4 KitKat and above. Fingerprint Support- Android M is the first version of Android that supports Fingerprint support at API level. If your phone supports Fingerprinting than every app or authorization requires your fingerprint but not passwords and PIN codes. You can also make purchases while shopping in real-life or within Play Store apps. Power and Charging- This another feature is used to improve the power standby time by making use of a new function known as Doze through motion detectors, Android will recognize when devices haven’t been interacted with for a while like if person fall asleep and phone left somewhere just to lesser the number of Background processes. Even in Doze mode, your Android can still start alarms or notify you of priority notifications. Application Links- If you click a Twitter link in an email, for example, the Twitter app will now open directly instead of asking if you want to use Twitter to view it. App links are being changed so that apps can open content directly, instead of stopping users every time with a dialog box in which the user has to select the app with which to open the link. Are you impressed what Google has done with the New Android M. Yes!!! I think. Kindly share below in comments if you have something to add into this story.